With Barry away for his annual holidays for the next month it has been left to myself Dave Rollett (captain) to update the blog on Barrys behalf, hopefully up to Barrys good standard but possibly no photos as we having trouble with downloading at present. A very good turnout this week for the four person team event texas scramble with 18 teams, 71 players (yes the last team was a 3 ball). The weather was very hot for all players from early starters and just got hotter as the day went on. Next weeks competition is The monthly Qualifying Individual Stableford Apollo Air Trophy. Sheets for next week are in the clubhouse now. Captains day 15th August sheet is also in the clubhouse and the evening event sign up sheet. (anyone who has previously put their name down for captains day could you put it down again as the previous sheet has strangely disappeared from the clubhouse) The evening presentation will be held at Los Balcones and will include entertainment and a 3 course meal, 1 drink and transport for the small fee of 20 euros all in, a great night to celebrate a great days golf competition, join us your all welcome. Another beautiful day for the 75 players who battled the tough format where a bad hole cannot be ignored and the ball must be holed out. Only one player managed to play below their handicap, Alicia Saunders, who knocked it around in a net 67 to win by 5 shots from the nearest challenger. Quite fitting, as Alicia organised the evening presentation, along with Kim Lloyd, who unfortunately is back in the UK at the moment. Below is Alicia with her trophy………………. Thanks to everyone who helped on the day, and also managed the start times, memberships and recording of scores. 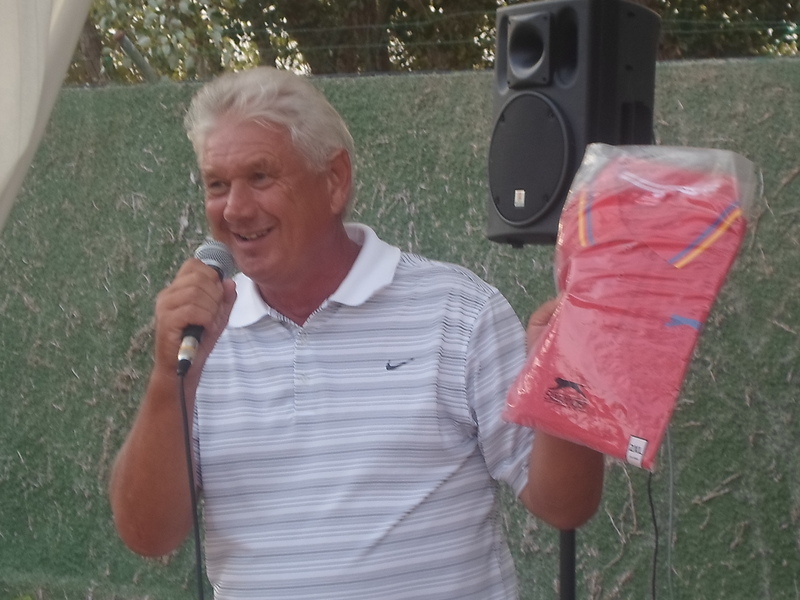 Bjorn and Astri donated a bag of goodies as a prize, which was drawn out for the guests present. Barry Answer gave some balls which were used for the junior prize. Everything ran like clockwork, so all the players could enjoy the day. As previously mentioned, Alicia and Kim dealt with the organisation of the evening venue, meals, prices and entertainment. Shani Ormston was a great singer, choosing songs that all the 80 guests enjoyed, and there were plenty on the dance floor. 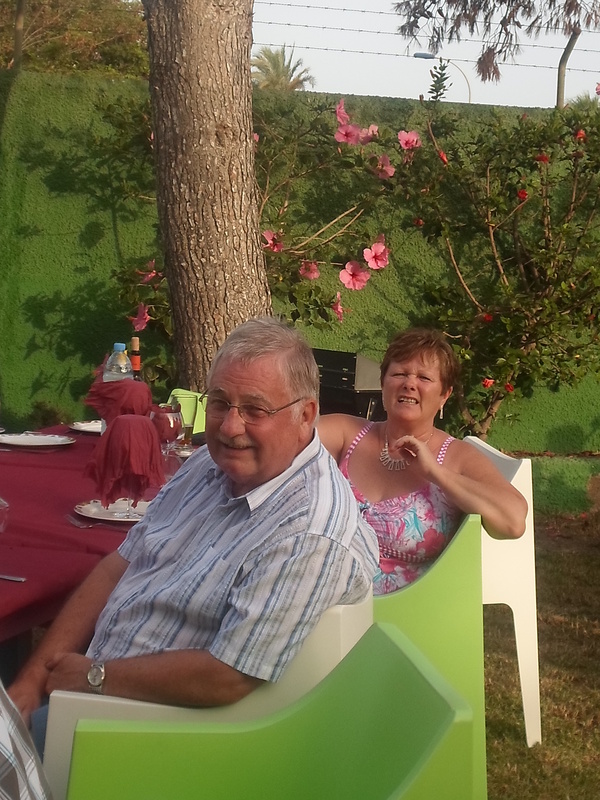 A great setting out on the lawn, eating good food al fresco at the Copi Coy Sports club near Bolnuevo. Kev again organised transport so everyone could enjoy a drink (or two!). You may have noticed that Kev won the booby prize. This was for the player who carried on to the end and put a score in even though you feel like giving up! He won a piggy bank which carried the label ‘swear box’. 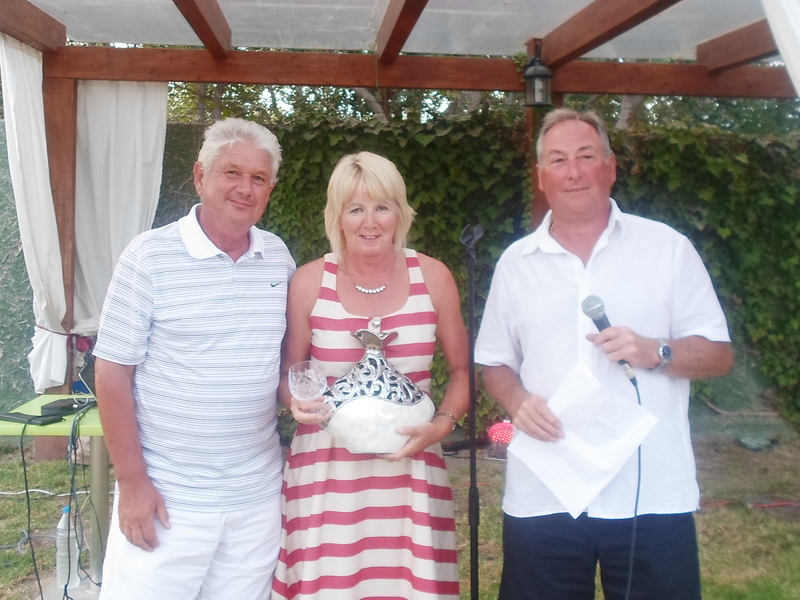 There was also a special prize for the player with the highest score on one hole – Maria Keldorf took 16 blows to get the ball in the hole on hole 9 – this included 9 shots from the greenside bunker! I presented Barry Answer with a new shirt. He arrived late Tuesday night solely to play in this competition, and after a few late night pints we decided to play at 9am Wednesday. After some of the worst golf he has ever played at Condado, fighting a hook that Henry Cooper would have been proud of, he finally managed to slice one into the dry lake on hole 5. It was a good ball, a Titleist 3, so he stretched to reach it with his well used ball retriever. It remained just out of reach, so he decided it was so near he must go down to get it. Go down he did, a great impersonation of his pal John Pitman, as his feet went in the air, he bounced down the rubber lining and landed in what must be the only patch of mud on Condado, after months without rain. Taking a penalty drop, his next shot went vertically upwards never to be seen again. If you find it, it had a black line under the 3 and you can leave it behind the bar in the Clover. His body was fine, but with damaged pride, rubber and mud stains on the back of his new shirt his first thought was that he would have to tell his wife, Denise. You may think why not just wash it? Well, Denise was back in the UK, and had given him instructions on how to operate a washing machine. Obviously he took as much notice as we all do during a Ryanair safety briefing. How to switch it on, how much powder, fabric softener, where does it go, what temperature, how long, coloured/white? Far too complicated, so he had to own up, and the next instruction was bring it home! His golf did not improve either after that, and to add insult to injury he reached the 12th tee where Denise normally brings out bacon butties and beer for his fourball – so he had to starve. That is why he is known as ‘Bacon Barry’ and players want to be in his team. Anyway, now he can throw away his shirt which has such bad memories, and wear his new one, shipped over from Sports Direct in Mansfield, which is by the way where he lives! Thanks for the entertainment Barry! Barry never learns, does he? Here he is on some part of the 10th which is not his favourite hole……………………………..
Below are photos from the day and evening, apologies that I am on too many of them. Mark Kummerer was 1st division winner……………. 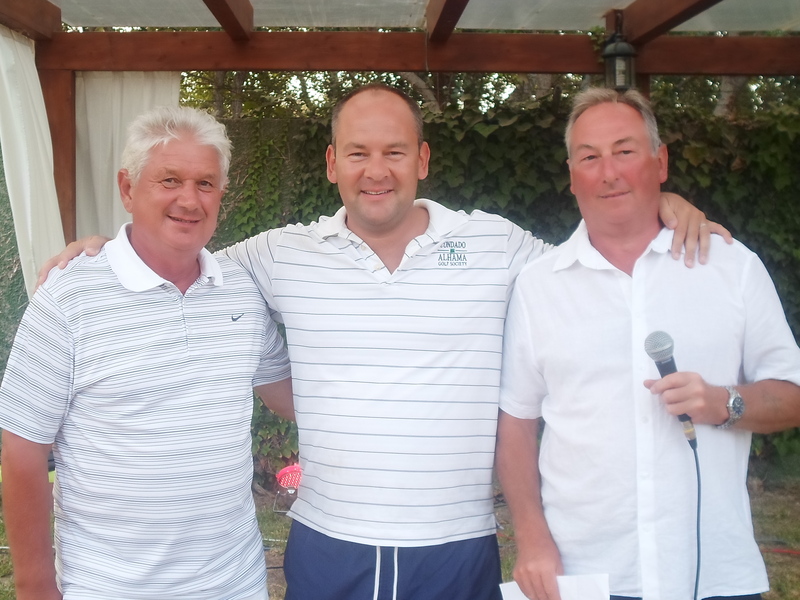 the only player to get a 2 was Joachim…………..
One last presentation…………………..Kevin Smith was presented with a range finder from the society in recognition of his contribution as vice-captain, captain, and president. He is at present serving his 2nd year as president. a well earned gift for Kev…………………. 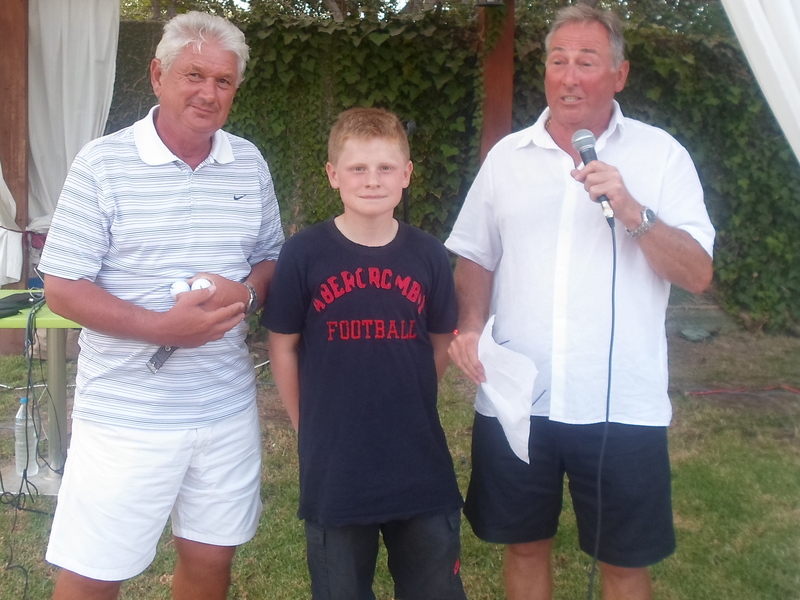 Well, those were the prize winners………………. unbelievable that both Barry and Tim had this lie with their balls touching……………………..
Tom McFarlane swings through to a good finish at hole 7……………..
a lovely setting out in the cool evening air………..
my birthday finished at midnight and that is when Heather’s started…………….. This week was a variation on the typical individual stableford, with the pairs totals being added together. One possible outcome may be that the player with the best score wins nothing! The 2 Peters again came in with a fantastic score which seemed unbeatable, but for the second time in 3 weeks they were pipped at the post. 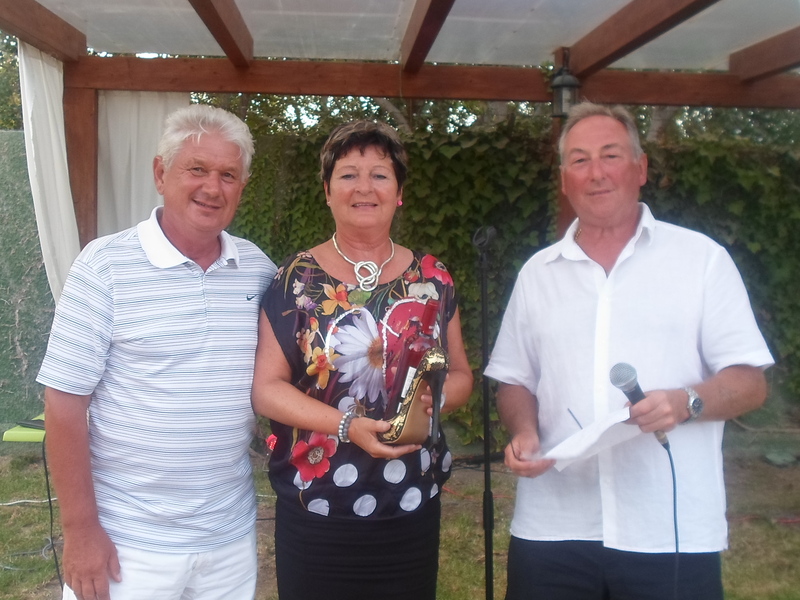 Ylva and Tore were this week’s winners……….. This week sees the La Torre leg of the IRM 6 course challenge. Our own Dave Lloyd and Chris King were lying in 3rd & 4th place, but are both back in the UK and will miss this one. All the dates for our major competitions for 2015 are listed on the previous blog (see link at top of home page). No excuse for not getting cheap flights early and playing in your favourite competitions! 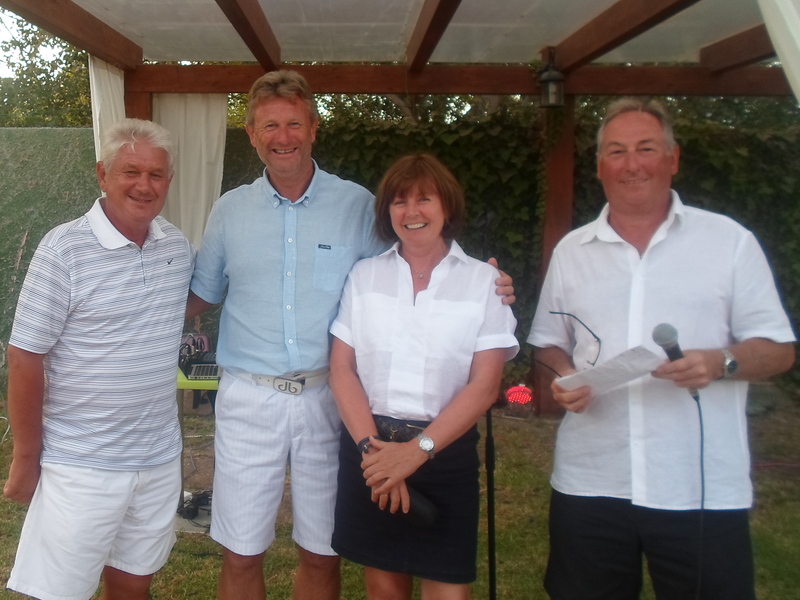 Last call for next week’s individual strokeplay (major) competition – contact bookings@cdagolf.com for a time. 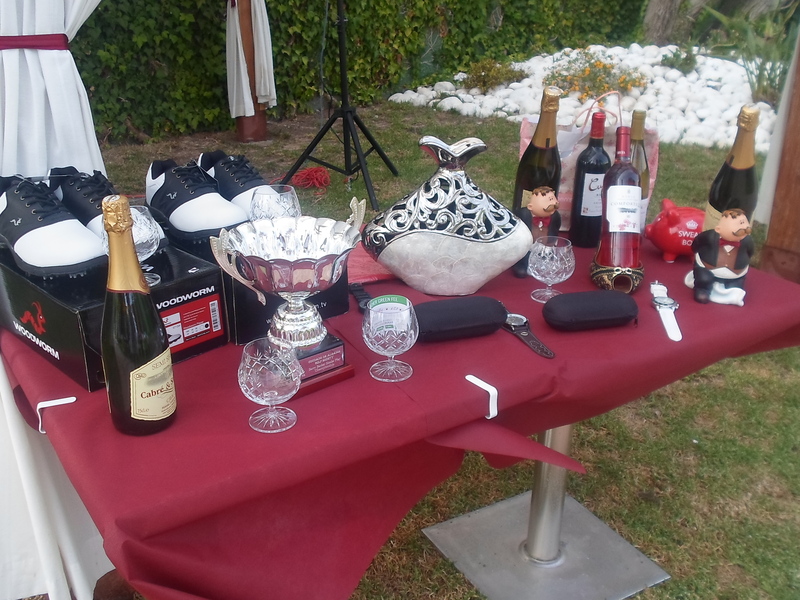 If you want to attend the presentation at Copi Coy (Bolnuevo) contact Alicia on events@cdagolf.com This will be an outdoor event on the lawns of Copi Coy with entertainment from Shani. The price is 15 euros for the 3 course meal (with a bottle of wine for 2). If you need transport on the coach this is available for 5 euros per person. 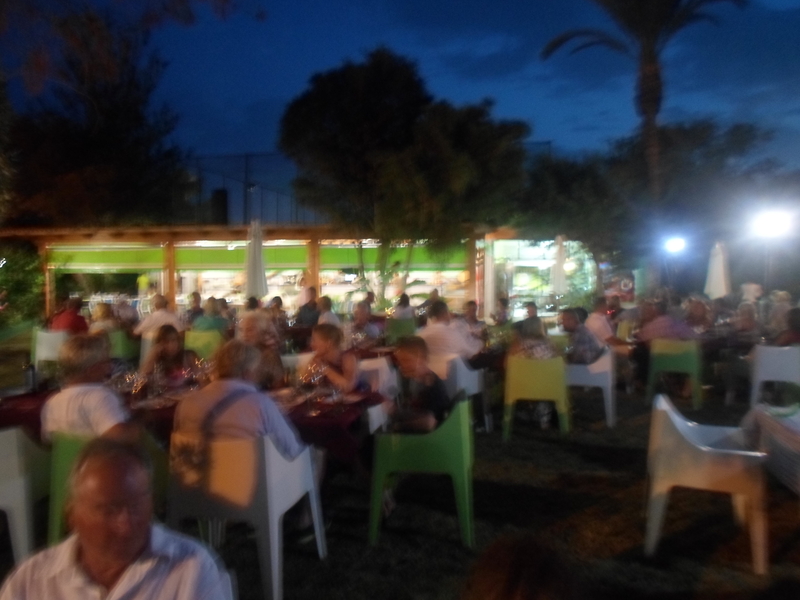 Our evening events are always a great success, especially now in the middle of summer with lovely warm evenings, and good music as you watch the sunset. Just a reminder that the overall winner (not divisional winners) must attend (presentation 7.30pm) but is not required to stay and have the meal. If no show or reasonable excuse (on a plane home?) the major prize will go to the next best score who is present. A current leaderboard will be on show all afternoon so players will know if they have a chance. For a final update ring me on 603290095. I will post results ASAP after the last game is in on this blog, if you prefer to find out the results before the evening out. There will be an overall winner, 1st & 2nd place in divisions 1, 2, ladies and nearest the pin on 17 for both gents and ladies and a mystery prize. It will be a fantastic day and night so get your name down if you are on site. On Friday August 22nd we have planned a fun day in the diary. Eden health & beauty palour in the Al Kasar have offered to sponsor the competition and provide all the prizes (and momentos). 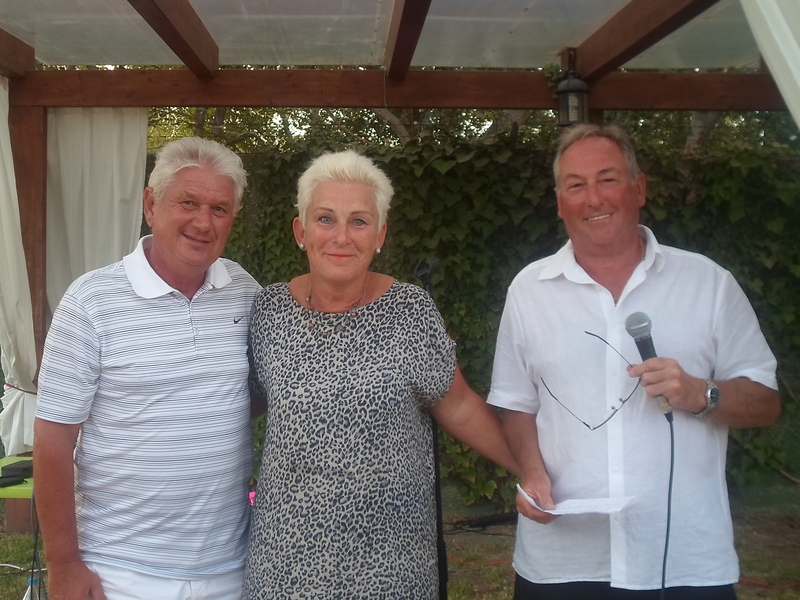 It will take the form of a pairs competition, with the added twist that the top prize will be for a team of 4 players – one pair will be drawn out with another pair in a different fourball and the scores totalled together. Similar to blind pairs but this will be a blind fourball! The head greenkeeper at Condado de Alhama (Jonathan) has kindly provided us with his email address so we can contact him with queries or suggestions about the course. If you have any comments please forward them to the captain Dave Rollett at bookings@cdagolf.com but please try to make them constructive. 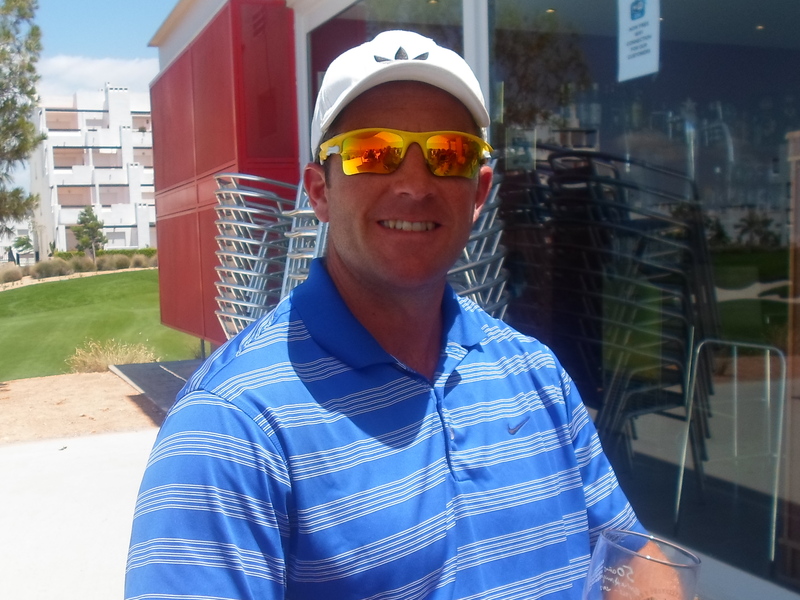 This week’s featured golfer is Scott McKechan who plays off a very respectable handicap of 6,8. Originally from Torquay he now lives in the Glasgow area. He is another of the many firefighters we have in the society. What are the benefits of moving to Switzerland? Well, the flag is a big plus………………………….. I can’t remember his name…………..it’s ‘P’ something, ‘T’ something, ‘R.’………….. In response to a request at the AGM the committee have confirmed the dates for next year’s major competitions. These will be in the diary, although this will not be published until November/December. Hopefully this will help members to book their flights in good time and at a good price hopefully. a view down the 12th…………. Another hot day for the 52 players who managed to get to the first tee – another 8 players had their names down but did not turn up. Not a big problem in an individual competition but a major one if it had been a team event. 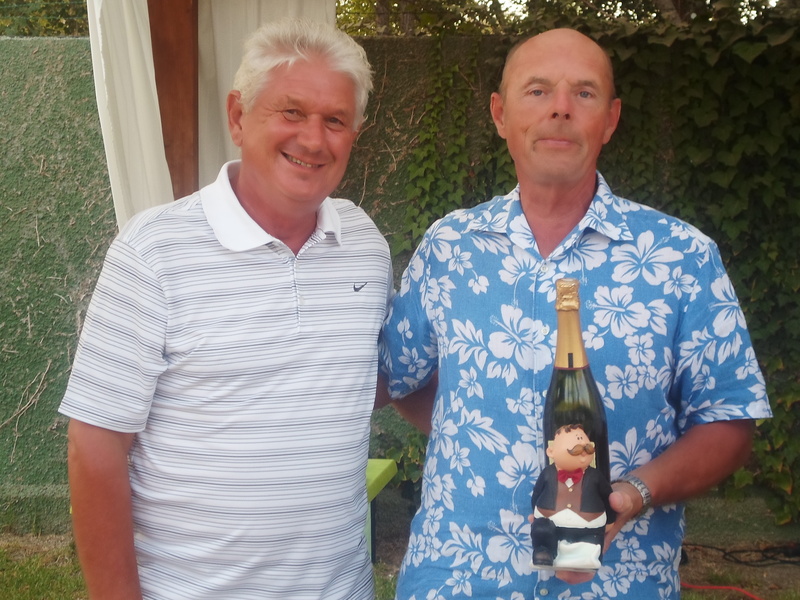 Dave Lloyd went close again posting a gross one over par 73, but he was pipped by just one point, with Mark Underhill taking this month’s trophy. 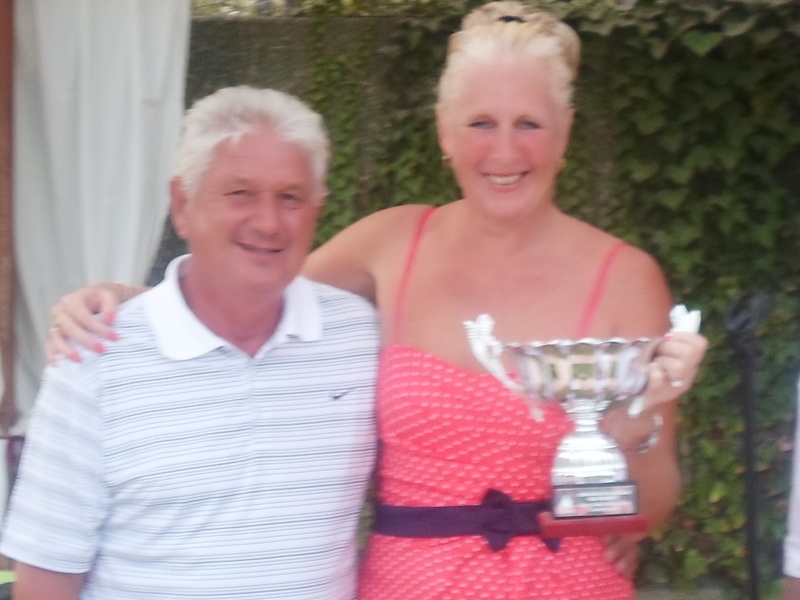 Dave Lloyd won division one so have inserted this photo (taken Wednesday). You can see how his feet are sunken into the rough, a precarious lie on a downslope , but he put it on the green pin-high……. this awkward lie was no problem to Dave……. 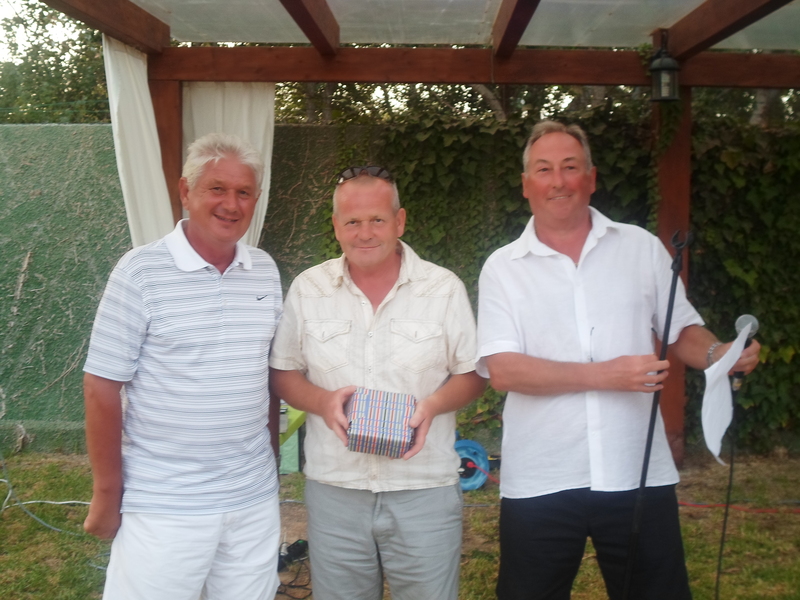 another good score from Astrid……………..
Congratulations to Kevin McKendry who had a hole in one at the 17th on Monday. Well done also for buying everyone a drink in the bar afterwards! Kevin will receive a momento from the society to recognise his achievement. 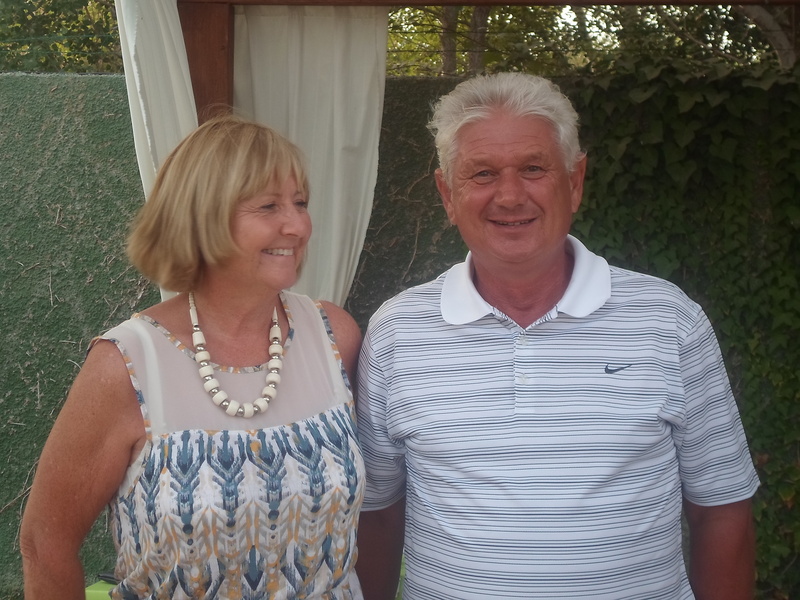 This week’s featured golfers are husband and wife Colin and Lynda Lloyd (no relation to Dave & Kim). They are the first featured golfers to come from the principality of Wales, to be more exact from Gavin and Stacey country Barry Island. Next week is a pairs aggregate stableford, and the following week is the strokeplay championship – contact bookings@cdagolf.com to reserve a start time.